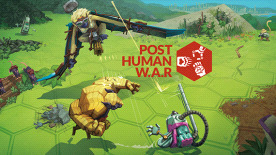 Post Human W.A.R is a turn-based, tactical and psychological strategy game. Form your armies and set off on an adventure through solo campaigns, or face off against players online! Experience a purely strategy-oriented gameplay with nothing left to chance, and filled with tactical challenges, bluffs and absurd humor.